Note: This was put up as an example of what I did only! I am not responsible for anything that you may or may not do whether you did or did not follow this example. Just look at the pretty pics, you cannot blame me if you break someting, start a fire, or anything else good or bad or neither! Don't you hate that you have to say things like this?! Goal: Get the video card silent! Time: took about 1/2 hour, was taking my time. I've been through my overclocking days. I've been through my 18-fans-in-a-case phase. Now I'm in my silence phase... What better way to go silent then to get rid of the blaringly loud GPU fan! This little 40mm screamer was the loudest fan in my case. So, I added this Zalman 'fanless' heatpipe GPU cooler. This is in an ATI 9800 (non-pro) and the recommend using a fan on it. Bottom line is that the sucker runs hot. However, 3dmark2k3 and GTA3 Vice City run fine w/ it! This was tested in the winter time when the office was 73 degrees. We'll see what happens in the summer time when the office is 84 degrees. I may have to add an optional fan to it and undervolt it for silence. 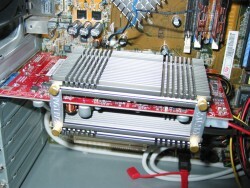 The Zalman Heatpipe (ZM80C-HP) and the ATI 9800 (non-pro). And we all know JJMAN is a bot!! Removal of the original HS and screaming banshee fan by first removing the little pins in the two fasteners, then popping off the HS. Luckily, the HS was just thermal compounded on, not glued on. Cleaning off the old thermal paste off the original HS so i can put it away in my parts bin, and also off of the GPU. I just used a papertowel and rubbing alcohol. 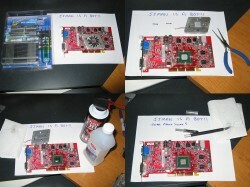 Application of extra Artic Silver 5 on the GPU as the GPU is a bit recessed from the surrounding frame. It did come w/ some thermal paste, but I used Arctic Silver 5. 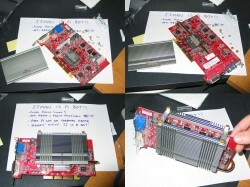 The ATI 9800 requires adapter 'A' from the Zalman Heatsink kit. It comes w/ an 'A' and a 'B' adapter. Here it is w/ Arctic Silver 5 on the top of adapter 'A' and on one of the huge heatsinks. Another shot of the 9800 w/ Zalman attached. It will take up your neighboring PCI slot. 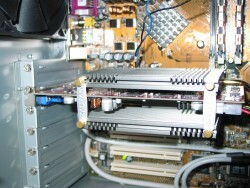 A shot of the ATI 9800 and zalman Heatpipe installed in the computer.